To be honest, I am having a hard time writing about my recent experience in FLAME RESTAURANT, Discovery Primea Makati. Not because the food and the service was lacking. On the contrary, everything was perfect. It's difficult for me to look for a way to start writing about something I truly enjoyed. They just blew me away. It wasn't the first time that I've set my foot inside FLAME. I've been here more than a couple of times before but never for lunch. Surprisingly, the crowd at FLAME was pretty good. A couple of power meetings on one side while leisure dining on the other. 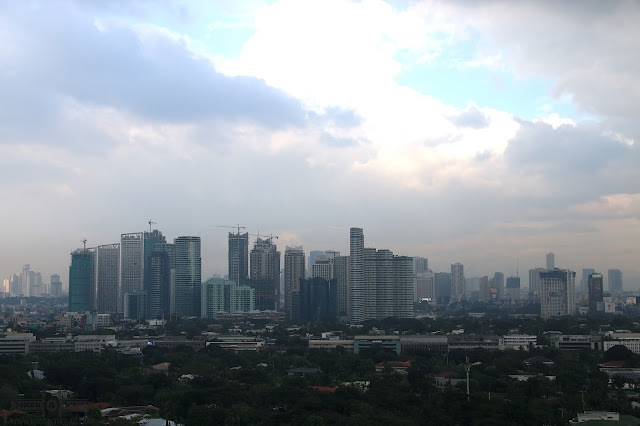 It's a mix of the Makati office workers and some expats as well. The view on this 16th floor restaurant is also a welcome treat. 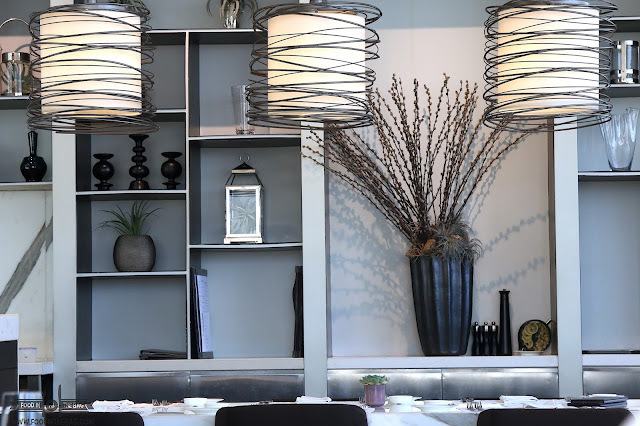 Once you enter Flame, you are greeted by a floor to ceiling light fixture. Quite impressive way to welcome guests. 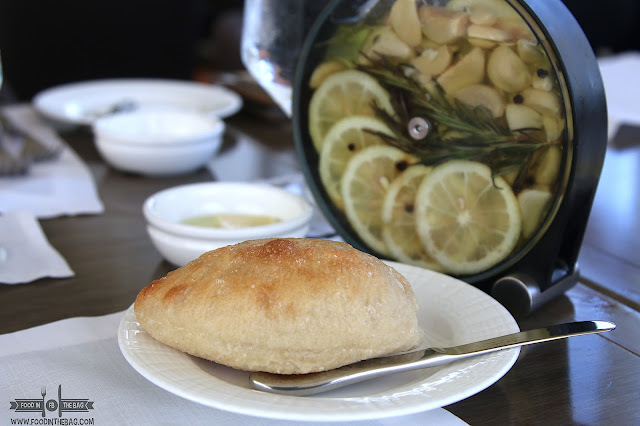 After taking your orders, bread with some butter and infused olive oil are served to start things up. There's actually an affordable lunch set menu during weekdays that comes with a starter, main, and dessert plus coffee or tea. 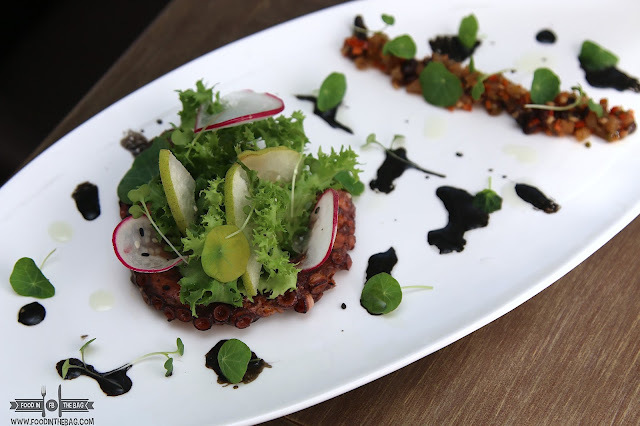 Two choices from the appetizer course would be the YELLOWFIN TUNA TATAKI and the GRILLED OCTOPUS SALAD. The Yellowfin Tuna Tataki has Japanese flavors infused in it. 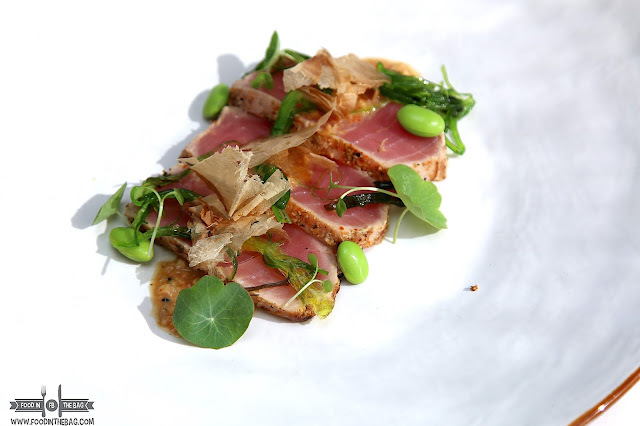 Having edamame, wakame, and bonito flakes on top of the seared tuna makes it a welcome treat. The Grilled Octopus Salad was very straight forward. It wasn't chewy but has that bite that you look for in seafood dishes. FLAME seems to be big on Asian Flavors using Western Techniques. It uses the best of both worlds that it lets your tongue dance with joy with every bite that you take. 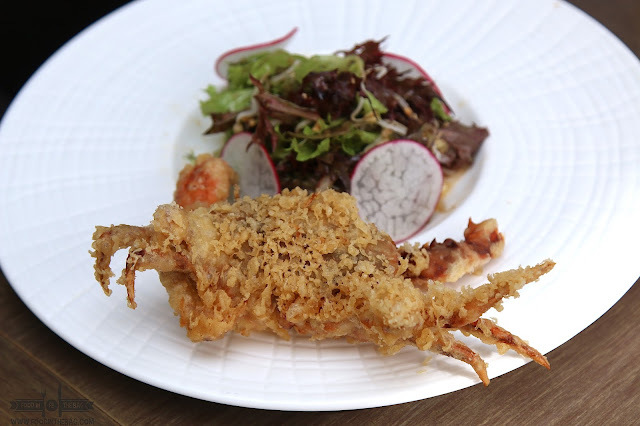 For someone that is trying to start the year with healthy dishes, the SOFT SHELL CRAB TEMPURA might do the trick. It's very simple yet done right. The crab is crunchy enough that you could just tear a leg off and have a go at it. 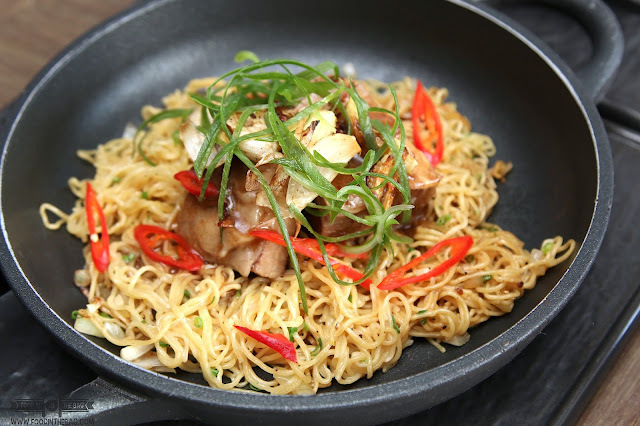 Partner it with the Saigon Herb Salad and you have a nice delicious start. 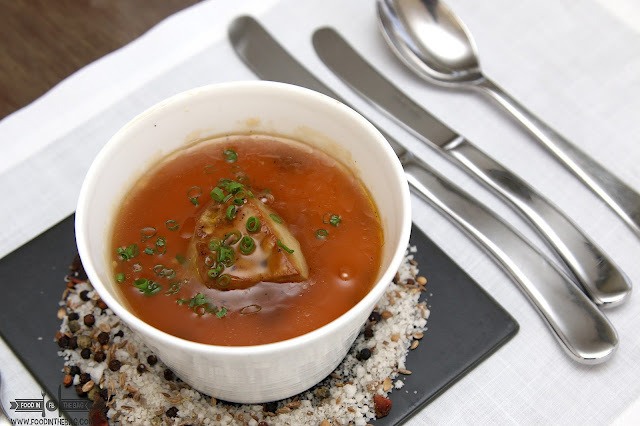 BUT if you want to really have some fun, you have to go for the FOIE GRAS CHAWANMUSHI. This is comfort food to the highest level. There must have been some secret sorcery happening in the kitchen. The Dashi broth was rich and decadent but not overpowering. The pudding like chawanmushi was straight on light and it did help that there was a generous piece of FOIE GRAS on top to balance everything out. If I could have this at home on a rainy day while watching netflix, my life would be set. If you're someone that likes something familiar, you might want to go for the CRISPY PORK BELLY DOUGHNUTS. Don't let the name fool you. 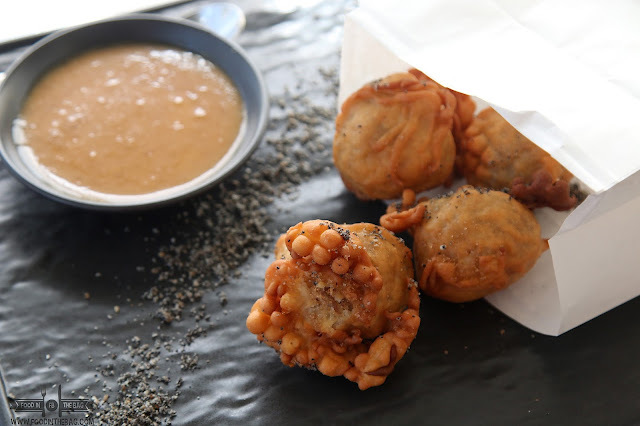 These balls are deep fried snacks perfect to take anywhere. Partnering it up with the butterscotch miso dip and you're good to go. Going back to the POWER LUNCH SET, two options from the ENTREE MENU would be the BRAISED LAMB and the ADOBO US BEEF SHORT PLATE. The ADOBO US BEEF SHORT PLATE was just amazing. Served with egg noodles, the beef was tender and had the right amount of adobo flavor. 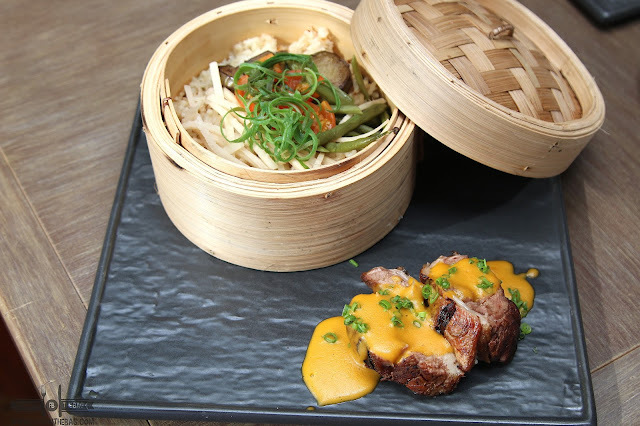 The BRAISED LAMB is a genius take on the Filipino dish Kare-Kare. The rice is bagoong flavored while the peanut sauce went great with the juicy lamb slices. 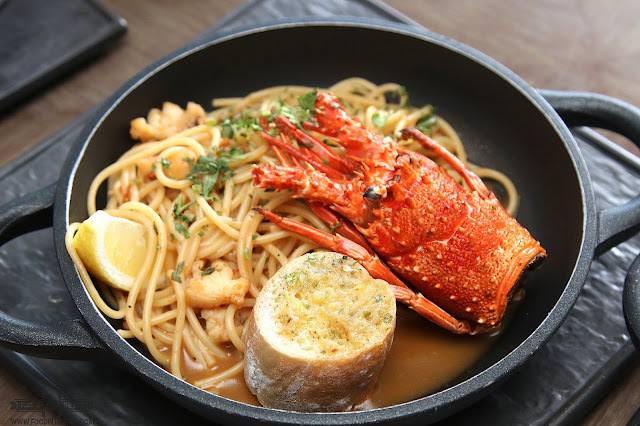 To warm things up, the CHILI LOBSTER SPAGHETTI gives you a jolt of spiciness. Not over powering and just right, the sriracha bisque went well with this pasta creation. 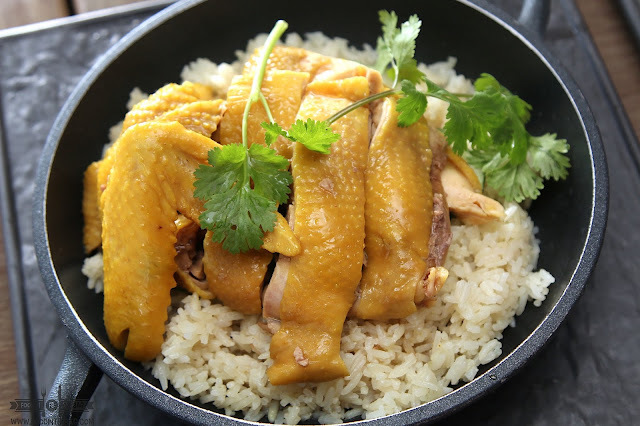 A dish that Chef Luis is very proud of, FLAME'S HAINANESE CHICKEN is filled with flavors and has just everything you would look for in a chicken dish. The cornfed chicken gives it it's yellowish color. The meat was marinated just right that combined with the rice, you get a playful sensation in your mouth. A visit to FLAME is not complete without ordering the famous TAKE OUT LOBSTER FRIED RICE. 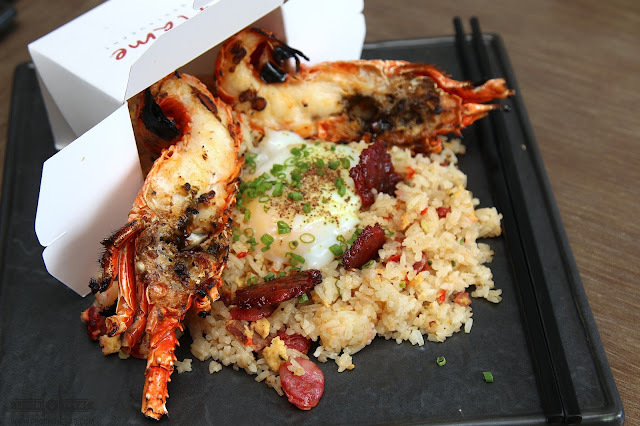 Served with a take out box, the lobster fried rice has a mix of pork, 63 degree egg, and lobster remoulade. 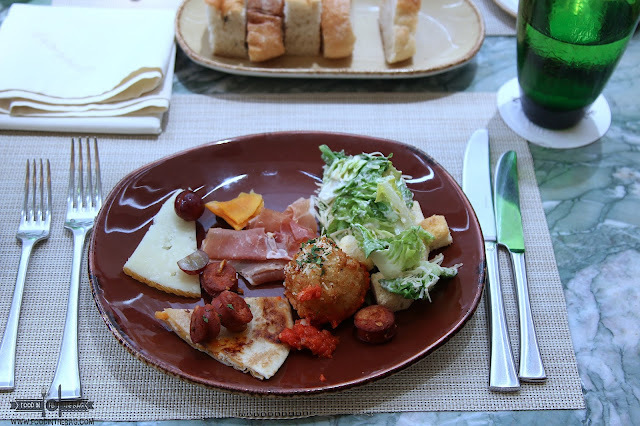 The flavors are bold and rich that you would like to end your lunch with a siesta. 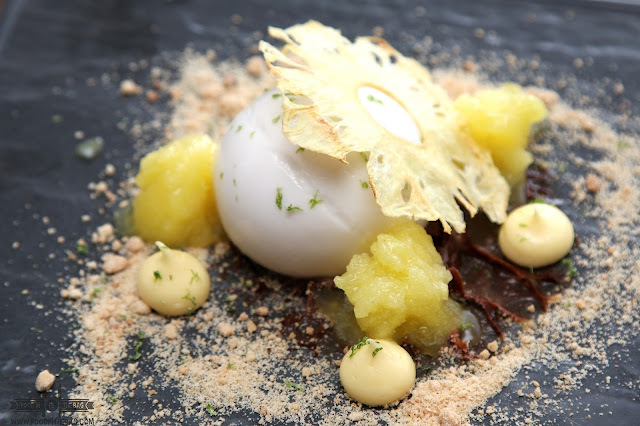 Dessert could be this COCONUT PANNA COTTA. Quite light and not overly sweet, the panna cotta is a wiggly dessert ball that's playful and a great way to end your lunch meal. 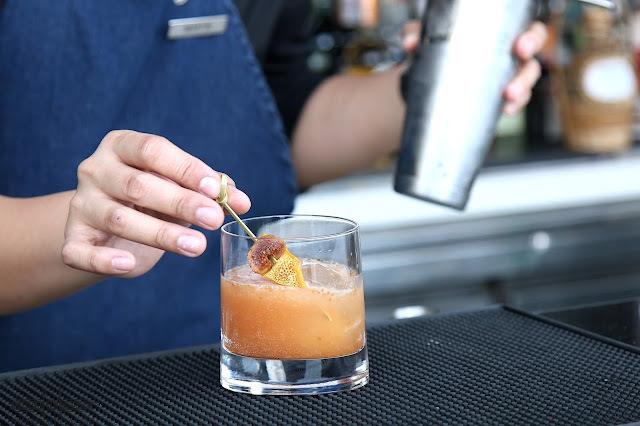 If you're like us that ended lunch around 4pm, you might want to head on over to the outside bar of DISCOVERY PRIMEA, still on its soft opening, EDGE is quite a treat. Stocked up with a lot of options, you won't go wrong with whatever they serve you. 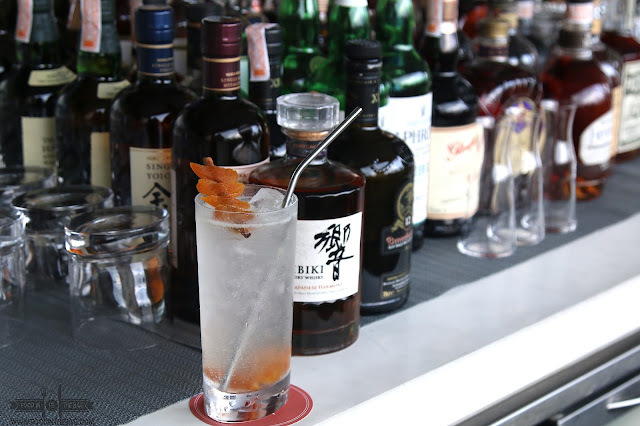 You could even ask the bartender to make you something that you prefer or you could check out their signature drinks. 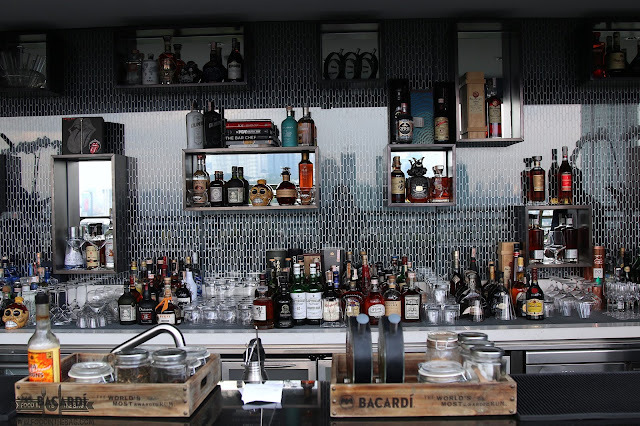 With a view of the Rockwell, BGC, and Makati Area, FLAME is the perfect place to have your lunch time getaway. 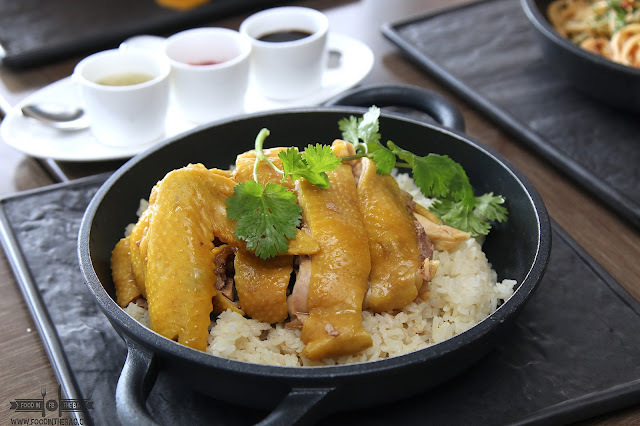 Here, you're able to enjoy a quick one or go the full monty and just relax and be fed amazing dishes. That was one heck of a meal that it's making me crave for it all over again.